In a statement, the band announced plans to return to Dallas on September 21. 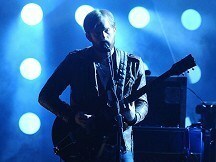 This follows Friday's mid-show cancellation, which Nathan Followill called a "fiasco" on Twitter. His abrupt departure was blamed on heat exhaustion and dehydration. The band also announced they wouldn't be performing in Houston on Sunday either. That show was rescheduled for September 22. The Nashville-based rock band is known for hits including the Grammy-winning anthem "Use Somebody".